Chilorio is a typical dish from the state of Sinaloa, in northern Mexico. The recipe for chilorio that we will prepare today is that of a traditional pork chilli. I explain this to you because I have the impression that the vegetarian versions, or made with soy, are getting a little more fashionable. But returning to the point, they I also recommend preparing some corn tortillas to accompany this preparation. 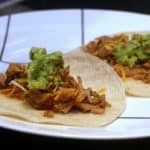 In this way, you can prepare a few tacos chilorio, like those in the photo. 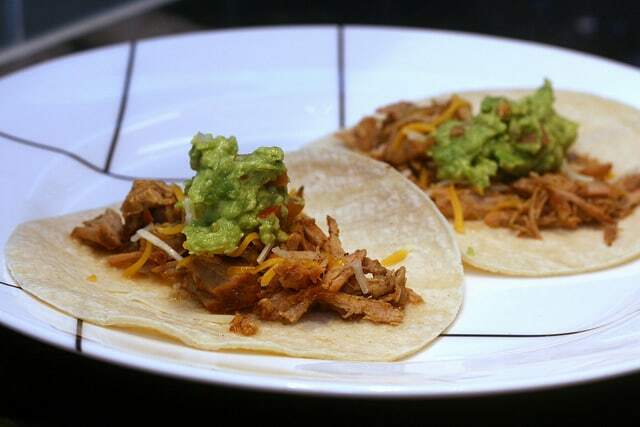 Another option is to use wheat tortillas (also as in the photo). Cooking recipe to prepare, step by step, a traditional chilorio in the style of Sinaloa.There we will place the meat, clean but without having removed the fat parts that could eventually have. This will help keep you more hydrated. To cook it, we will cover it with a Pair of cups of water and a little salt to taste. If you wish, you can taste the water with a little oregano powder, a bay leaf and a touch of pepper (fresh, preferably). Let the meat cook for 40 minutes. For this process, there are two schools. One, that cooks the uncovered meat but watches it closely to make sure it is moved frequently and that there are no parts that are cooked out of the liquid, because this would dry it out. The second school, cook the stuffed pork so that it is submerged all the time. This is up to the cook. Take advantage of the time the pig takes to cook , to do other tasks. Wash the chili peppers and remove the branch remains, seeds and veins. Boil a little water and when you remove it from the fire, use it to submerge the chiles. Leave them there for 10 minutes, so that they become softer. Meanwhile, peel the cloves of garlic. After soaking the chilies, drain them and pass them to a blender. Add the garlic, half a teaspoon of oregano powder, half of cumin, a pinch of salt, one of sugar and one of pepper. Process everything to get a sauce. If necessary, help yourself with a little of the water you used to boil the chiles, so that the blender crushes all the ingredients. Reserve this sauce, for the moment. When the meat is ready, heat up a large pan with a little butter. Drain the pieces of meat and cook them quickly so that they brown a little, on the surface. You have to do this very quickly so that the pig does not dry out. When you remove the meat of the pan, proceed to shred with the help of a pair of forks. Recover the pot where you cooked the pork before, and remove any remaining liquid. If necessary, add a little more butter and then, return the pork, bathed in the chili sauce prepared in the blender. Add three tablespoons of vinegar, mix everything, and let it cook over low heat, for 20 minutes. Do not cover the pot. After this cooking time, try the chilorio to verify the seasoning If necessary, correct with more salt and pepper, or other spices, and then mix very well. If you do not have lard you can use vegetable oil, although it is much more advisable to use the first ingredient. At the moment of Choosing pork, you can use palette as in our recipe, because it is easy to undo or shred. However, you can also use leg meat, loin or another type of solid. In addition to freshly made corn tortillas, serve with plenty of red sauce or green sauce. This site is in no way affiliated with or endorsed by Sweetie Pies Chicken Restaurant. It exists as a compendium of supporting information intended for informational purposes only.